The built in video preview provides live viewing of objects through your telescope using any compatible video capture device, and communications over a standard RS-232 interface allows remote operation of your camera from distances of over 150 feet (45m), allowing you to enjoy images of the night sky at a comfortable distance from your telescope. With the addition of an inexpensive third party app on your iOS or Android tablet, it even becomes possible to control and view the output from your MallinCam wirelessly. We’ve created an easy to follow tutorial on how to do this here. •Control all built in features of your MallinCam Astronomical Video CCD Camera without having to use the on-screen display or rear camera buttons. •View a live video image from your telescope. •Easily take and save photo snapshots and video clips with a single click of the mouse. •Take image sequences synchronized to the hyper mode exposure time. •Digitally zoom and scroll the live image right in the preview window. •Perform real-time dark frame subtraction on the incoming video signal, allowing long exposure times which previously could only be accomplished using complicated post-processing techniques. •Capture and display frame stacked or frame averaged live video. 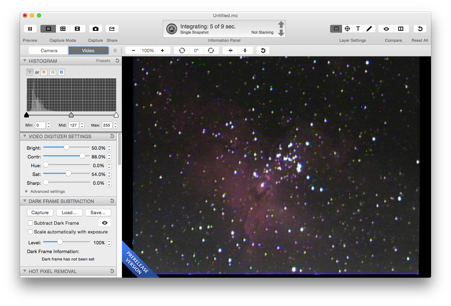 •Apply a number of live image filters, like the real-time Amp Glow Removal and Histogram Level Adjustment filters that can be used to drastically improve the appearance of nebulae, galaxies, and other deep sky objects. •Chose from a selection of crosshair and graduated astrometric reticles and grids which can be scaled, rotated, and adjusted, over top of the live video image. *Generic video cameras (including the MallinCam Jr., MallinCam MicroEX, etc.) are supported for display and processing of images only. Software control is not possible, but MallinCam Control has the capability of synchronizing images with the camera’s exposure settings so that frame stacking and timed captures work as expected. The technique for doing this is covered in the Getting Started Guide. MallinCam Control for Mac OS X - MallinCam Control requires an Intel based Macintosh running MacOS X 10.10 (Yosemite) or later and fully supports Retina Display resolutions and macOS Mojave (10.14) “Dark Mode”. This comprehensive 50 page guide will walk you through the basics of installing, registering and using MallinCam Control to collect images using your MallinCam Astronomical CCD Camera. The guide discusses connecting your MallinCam to your computer and explains how to use the built in video filters and real-time effects to obtain stunning images. 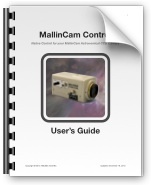 The MallinCam User’s Guide is available as a PDF download here. MallinCam Control can be downloaded from the software Downloads page. A single user MallinCam Control license can be purchased for only $49 and installed on up to two computers (Mac and/or Windows). Until it is registered, MallinCam Control will function in a time limited demo mode, allowing you to evaluate its features and test compatibility with your specific hardware configuration. A license includes unlimited online help and support as well as free updates until the next major release. Users of the previous version (2.x) can purchase an upgrade to version 3.x for a discounted fee. To take advantage of the upgrade pricing, download and install the new version. When launched the application will recognize your old registration information and will allow you to purchase an upgrade for only 50% off the full purchase price. Version 3 - Available for Mac and Windows! The MallinCam astronomical video CCD camera is one of the finest real-time astronomical imaging devices available. Each camera is hand-crafted in North America, and offers some of the most remarkable views obtainable through a telescope. MallinCam Control is our cross-platform image capture and control software which provides a powerful yet intuitive and user friendly interface that allows you to view images, record video, and easily adjust all settings on your camera using your Macintosh or Windows computer. Designed with both the novice and advanced user in mind, our software integrates seamlessly with your MallinCam camera to make your observing more productive and enjoyable.